The revenue of civil aviation flight training and simulation market is expected to reach 8.3 billion dollars by 2023. Artificial re-creation of aircraft flight and the environment in which it flies for pilot training, design or other purposes is called flight simulation. This simulated environment gives the same reaction to external factors as does the original flight and also simulates the equations of how flights fly. It is not only needed for just training purpose but also for research purposes and performance evaluation of trainees etc. It is expected that market for simulation and training will increase as the customers require advanced visual and motion technologies on par with the actual aircrafts today and their regulatory requirements. The demand for air travel and hence the need for pilots has significantly increased, for example, there was a 5.7% increase by September 2013 from September 2012 globally and the %increase was even more when seen region specific with highest being Asia Pacific. This demand for air travel and pilots also increased and increases the demand for aircraft simulation and training market. So far the highest market share in this segment is observed in North America followed by Asia pacific, Europe, Middle East, South America and Africa respectively. North America is expected to maintain its value while in other areas the market share can fluctuate because there are immense opportunities for new vendors to enter and also there is scope for joint ventures. The aviation sector has been hit in recent times with a growing demand for new pilots, as the airline industry continues to experience global shortages in the number of certified pilots. In the next 20 years, airlines in North America alone are going to be in need of around 117,000 new pilots. Projected shortage of airline pilots in the U.S. is expected to increase to over 2,000 by 2025, compared to the recorded pilot deficit of 155 in 2016. 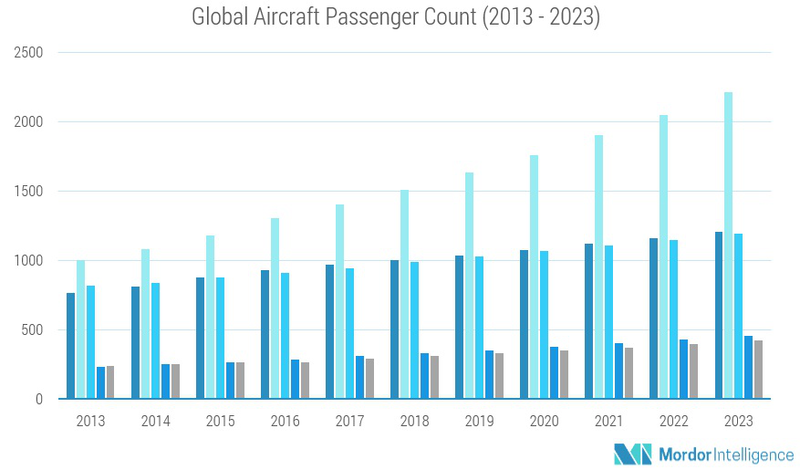 As the size of aircraft fleets continue to increase worldwide, coupled with the increased annual growth rate of the global air traffic passenger demand, many airline carriers have been forced into a reduction in the number of flight schedules due to a shortage of pilots. The growth of this market demands the need for trained pilots and improved aviation training methods. Another significant factor that is driving the market for virtual training methods is rising fuel prices, and growing international regulation of emissions and noise pollution. Thus, airlines prefer simulator-based training as it requires less time and costs compared to training on actual aircraft. Lately, the aerospace simulation and training market is moving towards high-fidelity displays. Earlier, multi-screen frameworks were used in the simulator to train pilots. However, with the presentation of collimated displays and Cobra curved display, flight simulators have experienced manifold change. The utilization of new technologies, such as computer graphics, mechanical actuation, and distributed computing are trends in the global civil aerospace simulation market that are improving the features of flight simulators. The increase in computing speed and memory capacity offered by high-performance computing capability is enabling simulators and training devices to produce better-quality images inside the cockpit. Under this background, ‘4th Annual Civil Aviation Training International Forum 2018 (CAPTF2018)’ will be held on December 5th �C 6th, 2018, in Chengdu, China. CATF2018 will share the latest information of China aviation training market to explore the opportunities in cooperation in China aviation training market. The forum will focus on how to build the bridge between aviation university training and airline opera-tions. Through the introduction of advanced equipment to improve the interest of training and reduce the gap between pilot training and actual flight.